We are a leading Exporter of exemptia injection, lupigest 100mg capsule, rabium 10mg, rablet i caps, emeset 4 tabs and geftib 250mg tabs from Nagpur, India. 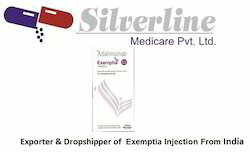 With the assistance of vendor’s skilled professionals, we are engaged in providing high grade Exemptia Injection. Offered Exemptia injection is grouped within a class of medications called biologic response modifiers, or biologics. Our provided Exemptia injection is used for the treatment of moderate to severe rheumatoid arthritis (RA). This Exemptia injection suppresses the immune system, patients are at a greater risk for getting serious infections. Since EXEMPTIATM suppresses the immune system, patients are at a greater risk for getting serious infections. Looking for Orthopaedic Segments ?